Universities — and the pursuit of our own pillars in life — were clearly on my mind and certainly reflective in my footsteps these past two weeks. “You’ve been to a lot of university campuses lately,” my daughter observed. I hadn’t realized it but sharing with her my recent travels and observations, it became overwhelmingly apparent that thoughts of higher learning were on my mind. Less than two weeks ago, I joined my husband for a trip north for his induction into the New England Basketball Hall of Fame. We flew into Hartford on a Wednesday, rented a car, then tooled around parts of Connecticut, Rhode Island and Massachusetts before joining the weekend festivities in Worcester. Within a matter of days, we’d toured several of New England’s universities. First was Hartford’s Trinity College, the second oldest college in Connecticut. We contrasted it while traipsing through the newer Quinnipiac University in suburban Hamden, home of the emerging Quinnipiac Poll. Later that afternoon, we walked the historic district of New Haven and strolled through the venerated ivy league campus of Yale. Thursday brought us to Providence, Rhode Island and the downtown district whose urban redevelopment I was anxious to see. After admiring several of the city’s restored buildings, we drove up to College Hill. There we approached Rhode Island School of Design which plays epicenter to much of the creative art world. We next stepped on to the campus of Brown University where I chatted with some of the summer research students. We drove onward to Newport, Rhode Island. Jimmy took a cliff walk and I signed up to tour one of several mansions that heralded back to the resort’s Gilded Age. 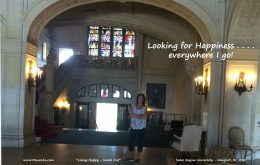 Searching for the Vanderbilt’s glorious “summer cottage” known as The Breakers, I stumbled upon Salve Regina University. This former shoreline mansion, owned by relatives of 1960s singer Robert Goulet, was bequeathed to a group of nuns during the 1940’s who converted it into a Catholic college for women. Today, Salve Regina flourishes anew as a coed gem in this stunning coastal town. Travel north brought us to the Boston suburbs of Chestnut Hill, Massachusetts. 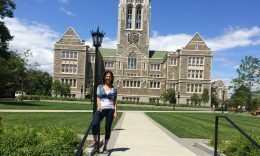 Before stopping for coffee with an old friend and cavorting with some cousins, we checked out the continued growth of our alma mater Boston College. Driving through nearby Newton I wondered why I hadn’t previously noticed the sign introducing the 50+ acre campus of Lasell College when I was a student in the very next town. By the time my husband and I arrived for weekend festivities at the DCU Center in Worcester, we toured Holy Cross. This intimate Jesuit college played fierce rival to BC in both academics and sports during our late 70s era and proved a window to our past. Oddly, travels through university campuses didn’t end with our New England trip. My husband flew home on Sunday and I took a New York bound bus where the educational pilgrimage continued. With reservations at Newark, NJ’s Robert Treat Hotel, I dropped in at Seton Hall University School of Law. Oddly, I hadn’t thought to revisit the school since I’d exited — mid-stream — as a law student in 1982. Back then, it marked a definitive moment to recalibrate both my life and career. Waning on the vine, I needed to find my own path to happiness and professional satisfaction. The following day, an old friend currently working on her PhD picked me up for lunch. She invited me to tour her East Orange campus of Seton Hall University and the graduate School of Diplomacy and International Relations where I met with several administrators. The next several days brought me to New York where I stayed with our daughter at her Brooklyn apartment. Given the great weather, I relished the opportunity to cover many of Manhattan’s streets on foot. One lengthy stroll brought me to Columbia University for a meeting at their Graduate School of Journalism; a peek into Columbia Law School where L1 students were congregating for orientation; and, finally, to the urban campus of Fordham University’s School of Law on my way back to midtown. While the number, scope and offerings of universities can overwhelm, enthrall and captivate any educational devotee, my intentions were directed elsewhere. Rather than checking out admissions statistics, education rankings from U.S. News & World Report or even tuition costs, I was on a different mission. My mission was to gain insights, absorb campus cultures and meet with educators, administrators and students. I wanted to investigate those on a path of personal happiness and find those heading toward career — and life — satisfaction. Not surprisingly, there was no correlation between happiness and rarefied universities. Nor did I find a lack of satisfaction or joy at some of the lesser known institutions of higher learning. Instead, I discovered that the stressed, anxious and sometimes near panic-stricken students were those feeling compelled to attain outward goals held in esteem by others — rather than themselves. Conversely, the more joyous, confident and energized students were those whose university provided them with the conduit to do what they had a personal passion for — and engage with what they truly loved. When at Columbia’s campus, I was inspired to ask: What are the pillars of your life? An engaging sophomore I interviewed indulged me by capturing the moment on video and I hope you pause to ask yourself this question, too. You may be studying as an undergrad, a graduate student or even as a life long learner. Whatever your goals, may you find your pursuits of higher learning helping you to raise the unique — and satisfying — pillars of your life!